Wondering how to hang art or a mirror without all of the fuss? Have you done this before… put a few nails in a wall, hang your artwork, then see that it’s crooked? Then you have to reposition the artwork so that it covers the wrong hole and hope that you get it right the second time. Or maybe it doesn’t look quite right in the space at all. You’re not alone. Hanging art and mirrors can be challenging if you don’t know a few secrets. You don’t want to spend all of your time looking up at your artwork, nor do your guests. It’s best to hang your pictures, mirrors, and any other artwork at eye level (unless you have low ceilings). If you have extra high ceilings, it will look awkward to hang pictures at eye level, leaving all that blank wall space above. Instead, divide the height of your wall into four equal sections. Then hang your pictures and artwork in the third section from the floor. One exception to this rule is in children’s rooms. You may want to hang art at their eye level or at least lower than your own. Your art should be in proportion to the surrounding space. So, no small pieces mounted up high or on large walls unless it’s part of a gallery wall display. 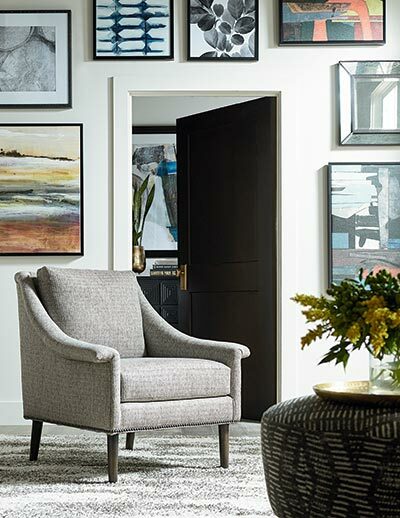 Avoid hanging large pieces of art that overpower a wall or room. When hanging artwork, a mirror or pictures above a sofa, the bottom of the piece should fall between six and eight inches above the top of your furniture. And the width should run about two-thirds the length of your sofa. When choosing art to hang above a fireplace, make sure your piece is at least as wide as the fireplace, but no wider than the mantle. This one’s a biggie… hang your artwork 57 inches on center. This is probably the biggest secret no one knows. Fifty-seven inches is the average person’s eye height. Art galleries use this measurement when hanging art on their walls. 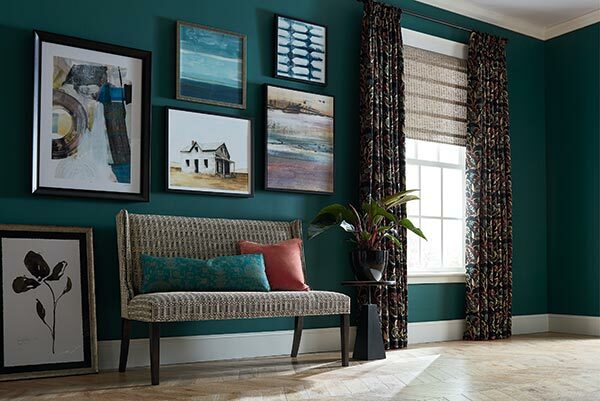 By hanging your artwork at the same center line versus lining up the tops or bottoms of the frames, you’ll have a continuous visual center line as the eye looks around the room. Step 1: Measure 57 inches from the bottom of the floor and lightly mark it on the wall with a pencil. Step 2: Measure your artwork and divide by two to get the center of your artwork. Step 2 – Step 3 = How far above the 57-inch mark to place your nail. Step 5: Mark your nail hole lightly with a pencil & hang your art! Note: If your picture or art will require two nails, be sure to use a level, a string or a yardstick to ensure you set the nails level for the picture to hang. The same 57-inch concept applies if you are creating a gallery wall using art, mirrors or another display. Start by hanging your center art work / pictures first, making sure that the center of these pieces remains at 57 inches above the floor. Then hang the rest of your gallery pieces above and below. Generally, allow two inches between a display of large pieces or pictures with wide frames. If your display consists of smaller photos, then allow one to 1 ½ inches between your frames. And what type of picture frames should you choose? Well, the answer there is varied. You may want to create a display using identical frames, the same frame in different colors or the same color frame throughout. If you’re into vintage, then maybe you decide on an eclectic array of vintage frames to hang on your wall. It’s up to you. Just start from the center when hanging your gallery wall and work your way out. If you’re not sure on what pattern to use for your gallery wall, you may want to draw it on paper first. Another option is to cut out paper or newspaper to match the size of all of your frames. Then play with different layouts using your paper cutouts on the floor until you get it right. The most important thing is to have fun! Your pictures, mirorrs, and art should reflect your style and personality. It’s an extension of you, so let yourself shine through in your art and your display. Basset has a fun selection of art for everyone’s styles and tastes. Learn more about Gallery Walls here!